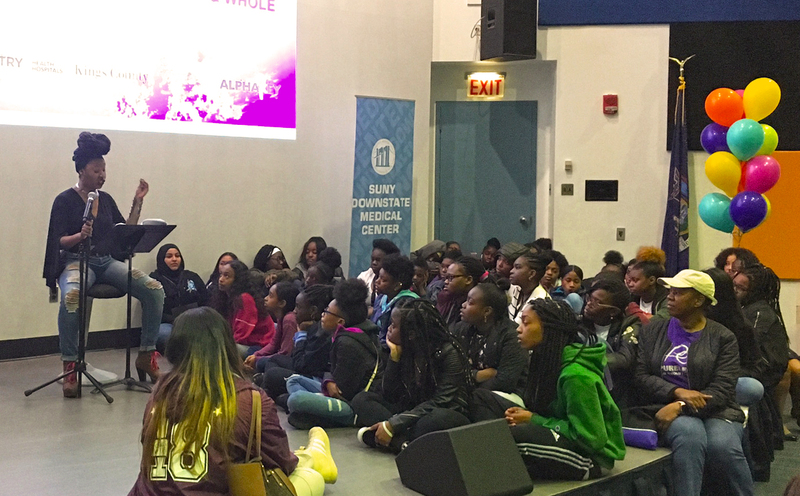 CAMBA Family Support Program hosted its 2nd Annual Phenomenal Girls’ Symposium on May 12 and this year’s event attracted 74 girls from ages 11-18 to SUNY Downstate Medical Center on what turned out to be a chilly and soggy Saturday. Still, that did not dampen their spirits as the girls engaged in lively talks and sharing of information during the day long activities of workshops on self-discovery. Topics included goal setting, career paths, body image, confidence, wellness, reproductive health and STI (D) prevention. Venetta Vanhorne, Assistant Program Manager of Healthy Families and Director of CAMBA’s iCARE Program created the Phenomenal Girls’ Symposium (PGS) to empower and motivate young women of color in Brooklyn with new and innovative approaches to education and health. Venetta’s goal with PGS is to give young women the tools to develop their self-image, shape their future goals and help them make positive choices. The day’s events supported the girls’ overall success through interactive activities and by identifying positive role models. The Symposium began with a captivating performance by the Danse Xpressions Dance Company that specializes in jazz, hip-hop, contemporary and Afro-Caribbean styles. The girls then heard from keynote speaker, Queen GodIs, a Brooklyn-native and international performance artist, who is also an experienced designer who has worked in the arts, education for the past 20 years. Queen GodIs read selections from famed author Maya Angelou and invited the girls to join her on the stage to discuss the works and the impact on their lives. After that presentation, the girls went into age appropriate workshops. During these discussions they were able to get in-depth answers to questions from women who were once in their shoes. These workshop leaders were a myriad of educated women of color from different career backgrounds who served as mentors to the girls, and shared their experiences, offering valuable advice. The day ended with a panel moderated by Kimberley Ramsay, LCSW, featuring panelists ShalomIsrael Diggs, a visual artist, dancer and teacher; Dr. Cheryline Pezzuillo, a Clinical Instructor of Cariology and Comprehensive Care at the NYU College of Dentistry; Dr. Wendy Wilcox, Chair of the Department of Obstetrics and Gynecology for Kings County Hospital, as well as Associate Professor of Obstetrics at SUNY Downstate and St. Georges University and Melissa Cross-Hadley, a Senior Associate, Global Public Sector, Grant Thornton LLP. Each of the panelists had remarkable insights on how the girls could bring their career dreams into reality. The staff, panelist, parents and participants all came away from the day feeling empowered and inspired. The girls completed surveys rating their experience at PGS and the response was overwhelmingly positive: there was a 98 percent attendee satisfaction rating. Some participants wanted to have the event more than once a year. In March of this year, Venetta brought the Phenomenal Girls’ Symposium to Jamaica W.I. and Mount Salem Primary and Junior High School, which Venetta attended as a child. GoInspired Jamaica Foundation helped fund this effort. The school partnered with the Mandigo Youth Club to facilitate 50 girls attending the Symposium in a community under state emergency due to high crime and violence. This symposium’s content was similar to Brooklyn’s, but focused on the challenges the young women face from gender-based violence, HIV/AIDS, self-esteem and academic achievement. Venetta was glad she was able to bring the symposium, free of charge, to the young women in Jamaica who would otherwise not have had access to these resources. It was also a full circle moment for her to return to the school where she struggled when she entered in the 3rd grade and was unable to read and write and is now able to inspire success for other young women. Venetta says she was able to execute her vision of the Phenomenal Girls’ Symposium through the support from CAMBA, SUNY Downstate Medical Center and the state partners. All of us at CAMBA salute Venetta for her incredible successes and support her efforts to guide young women towards discovering their potential.